The past two decades have seen an increase in the number oforganisations working together in multiagency settings andincreased calls for partnership and participation in organisationaland public life. Models for this kind of working arrangement rangefrom contracting out and joint planning, through to more formalarrangements such as setting up a joint agency. How to make thesearrangements effective in developing policy and aidingdecision-making can, however, be problematic. To make themultiagency setting work, organisations must manage diversity,resolve conflict and promote collaboration. 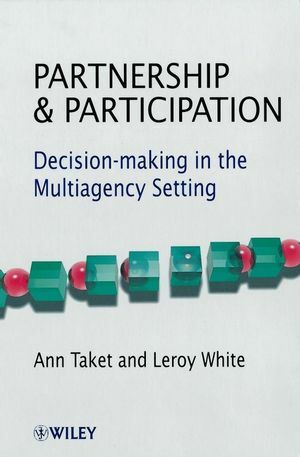 The processes foreffective decision-making in multiagency settings form the centralconcern of this book. Group processes must become moreparticipatory, democratic and empowering. Illustrated with casestudies drawn from the US, Africa, Asia, Latin America, as well asthe UK and Europe, the book surveys the range of multiagencysettings, explores the mechanisms and processes for multiagencywork, and reviews a range of processes and tools that have shownthemselves to be effective. Partnership & Participation offersno guaranteed answers, but provides a useful framework andstimulating guidelines for those facing the many questions that areraised by working in a multiagency setting. Ann Taket, Professor of Primary Health Care, Faculty of Health & Social Sciences, South Bank University, London. Has over 18 years experience in OR and Health Services Researchand has over 100 publications. She has worked as advisor to WHO, ODA and the British Council. Leroy White, Principal Lecturer in Primary & Community Care Reearch, Faculty of Health & Social Sciences, South Bank University, London. Has over 10 years experience in OR in both the UK and developing countries. He has over 30 publications. Leroy White & Ann Taket contributed 'Critiquing Multimethodology as Metamethodology: Working Towards Pragmatic Pluralism' to the Wiley book 'Multimethodology', edited by John Mingers and Tony Gill. Introduction to the Multiagency Setting. Methods Used in Multiagency Settings. Pluralism in the 'Nature' of the Client. Pluralism in the Use of Specific Methods/Techniques. Pluralism in the Facilitation Process. Using the PANDA Framework for Planning Process.